Mark your calendars – on Saturday, June 20, students and staff at Kajonkiet International School will be pulling out all stops to bring you their biggest and best “End of Year Show” to date, featuring three exciting productions from each of their Key Stage groups. 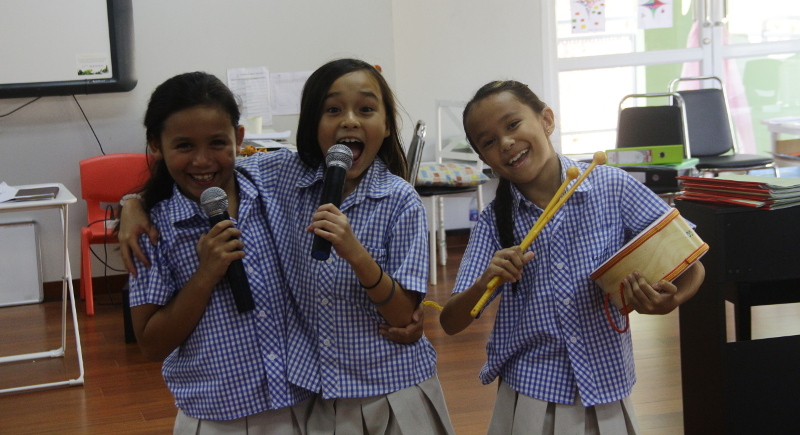 This year, the school has reserved the stage at the spacious Simon Star Theatre in Phuket Town to bring you three fantastic shows you don’t want to miss – The Pied Piper of Phuket, Bugsy Malone and A Midsummer Night’s Dream, with show times at 8:30am, 9:30am and 11:15am, respectively. The suggested donation of B400 per ticket includes a buffet lunch after the three shows. While part of the proceeds will cover production overheads – equipment rentals and the theatre itself, for example – additional proceeds from the show will be donated to the sole school on the remote island of Koh Lone, just off Phuket, which is in need of some TLC and new materials. That said, those with a kind heart are more than welcome to donate more than the suggested amount – after all, it’s for a good cause. And now a sneak peak at each of the upcoming productions. Set on the tropical island of Phuket in the village of Rawai, The Pied Piper of Phuket takes place a few months ago; the people of Phuket are not happy because there are so many rats. So they go to the mayor for help. Then a woman shows up who says she can help their problem for the price of 10,000 gold coins, to which the mayor agrees. But can the pied piper do it, and will the mayor keep his promise? Director of the production, Key Stage 1 teacher, Ms Peta has worked diligently over the past five weeks preparing, coordinating and rehearsing with the dozens of young students who range in age from two to seven years old. With about 10 main roles, and dozens of supporting roles, including 20-30 rats played by nursery students, and six dancers – one can imagine the level of patience and perseverance required in bringing everything together. 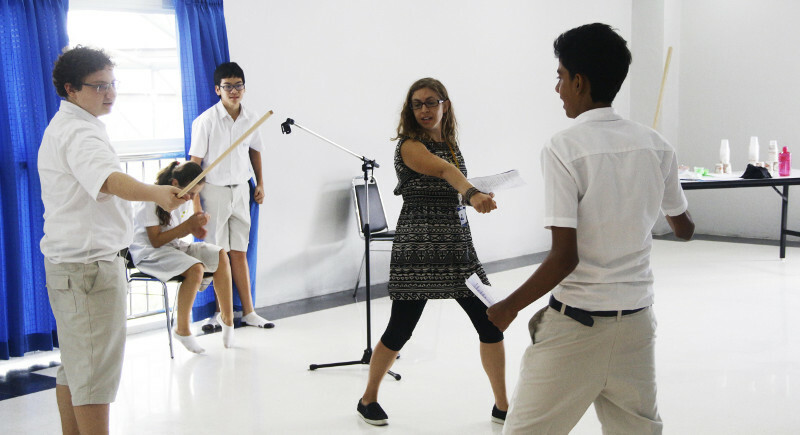 “It has been great practice for the students to listen to and follow direction, remembering their lines and cues – when to come on and off and so forth,” said Ms Peta, who chose the production and took a day to rewrite and adapt the script. Based on the famous poem Pied Piper of Hamelin by Robert Browning, the production is popular among Year 3 and 4 theatre classes in the west, she notes. But Ms Peta has creatively re-adapted the script and score to be quirky and humorous for local and modern audiences. For example they have adapted a few popular kids songs by changing the hook lines to match the story (Look forward to numbers such as What does the Rat say? ’and Who let the rats out?). Another interesting deviation from the original is the part of the main character – the pied piper – which though is traditionally played by a boy, will instead be represented by an aspiring young actress, Jasmine, who earned the lead part after an impressive audition showcasing impressive dancing, singing and acting talent. The curtain opens at 8.30am. Leading the production team for Bugsy Malone has been KIS’ Drama and Music Teacher Mr Davison, along with Year 5 Ms Pegram, who have coordinated all of the acting, singing and dancing. It’s shaping up to be quite the production, with 100-120 students on stage at any one time. “All Key Stage 2 students, from 7-12 years old, are going to be involved, whether acting, dancing, or part of the chorus section. For students who didn’t sign up for a part, they’ll contribute as part of the chorus section,” noted Mr Davison. Based on the 1976 film, Bugsy Malone is the name of the play and main protagonist of the story who unites two rival gangs – Fat Sam’s gang and Dandy Dan’s gang. Set in New York in the 1920s, the story promotes and emphasises the themes of unity and friendship. “There are a lot of good characters in the story that match our students, and since we always try to promote unity and friendship at the school, Bugsy Malone was ideal,” explained Ms Pegram, who has held the original 1976 film dear to her heart since she was a young child. “In the original, which also starred children, they used splurge guns filled with custard, so the rivalry was expressed more jokingly, not violently … In our rendition, we’re going with super-soakers attached with silly string,” added Mr Davison. The team has been working from the script from the Junior Broadway version of the playwright, but have adapted it to be more “manageable and digestible” for the modern, Phuket audience. “Some of the jokes and references were a little dated, so we’ve taken out, and added bits to suit our audience and the current time, but at the same time didn’t want to stray too far from the original,” Mr Davison said. Audiences can expect not only some lively and engaging acting, but lots of singing and carefully choreographed dancing as well, with a total of nine musical numbers to look forward to, five of which will involve the entire set – actors, actresses and chorus members. And there will be a few surprises, but you’ve got to come to find out. The curtain opens at 9:30am. Based on the popular playwright by Shakesphere, Midsummer Night’s Dream is a romantic comedy in its classic sense. Set in ancient Greece, the story revolves around two Athenien couples in love against their fathers’ wishes. When the lovers run off into the forest to be together, they meet fairies who create a lot of mischief, featuring heartache and love triangles that must be sorted out before the final curtain draws. “The kids have done really great considering how complex the script and language can be. We’ve changed some of the language, and added a few of our own elements,” said Director Ms Crowley, Key Stage 3 English teacher. Ms Crowley noted that though many of the students had never been involved in a theatrical production prior to this, she is pleased how everything has been coming together, with lots of support and encouragement from other teachers. All in there are about 20 speaking roles, and several students will be in charge of props. Plus, there’s a student director, and dance choreographer, and some students will be supporting the production by playing the parts of animals and trees, for example. All in, most of the key stage, or about 45 students will contribute to the production in one way or another. And while there won’t be any special singing sets (you’ll get your fill in Bugsy Malone), there will be a special, student-choreographed Thai fairy dance, as well as a ballet performance and not to mention, an engaging sword fight the students have carefully been practising. The curtain opens from 11:15am.